The Federal Government through its innovative and critical Geriatrics Workforce Enhancement Program allows Housing Opportunities & Maintenance for the Elderly (H.O.M.E.) and The University of Illinois at Chicago (UIC) to expand existing community health programs through our ENGAGE – IL initiative. Our partnership values Community Based Participatory Research, Programming, and Evaluation. The intergenerational H.O.M.E. community, comprised of older adult residents and residential assistants, their families, volunteers, coordinators, alongside the UIC Interprofessional (IP) ENGAGE – IL Leadership Team, selected health education geriatric topics most salient to their housing communities Pat Crowley House and Nathalie Salmon House) through small group discussion among staff partners and focus groups with residents. The UIC IP Leadership ENGAGE – IL Team presented a series of interactive educational programs based on the H.O.M.E.-identified older adult health topics throughout the cold, grey month of January 2016 (better known as Thursdays at H.O.M.E.). We aimed to invite other relevant H.O.M.E. partners and staff to learn with us as well. The overall goal of the training was to empower older adult residents in their health outcomes, as well as to increase their knowledge, self-confidence, and hope. We made sure to include H.O.M.E. in the evaluation planning process and to share all respective data results. The UIC Engage – IL Evaluation Team engaged in “member-checking” with H.O.M.E. after data collection and initial analysis. The H.O.M.E and UIC partnership began six years ago with the UIC College of Medicine Patient-Centered Scholars Program. Patient-Centered Care Scholars participate in a service learning program to train medical students to care for the elderly. The primary goal of the M2 year, “Patient-Centered Care for Vulnerable Populations” is to enable students to apply key concepts of patient-centered care to underserved vulnerable populations, particularly those who are afflicted with HIV/AIDS, the homeless, victims of domestic violence, immigrant & refugee groups and/or the elderly. The primary goal of the M4 year, “Interprofessional Approaches to Health Disparities (IAHD)” is to prepare students to be future leaders in improving health care for underserved populations. The IAHD program is an interprofessional elective for 4th year medicine and pharmacy students and Master’s level nursing, social work and public health students, through the UIC Colleges of Medicine, Nursing, Pharmacy, Social Work and the School of Public Health, and with faculty from the participating schools. For over 30 years, H.O.M.E. has changed the lives of thousands of the over 50,000 seniors in the city of Chicago that live in extreme poverty. 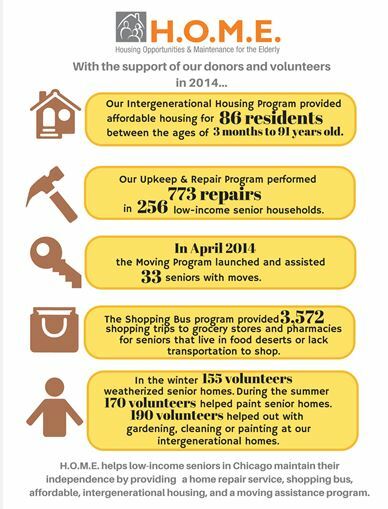 Committed to improving the quality of life for Chicago’s low-income elderly, H.O.M.E. provides intergenerational living environments with person-centered support for daily living.